How can you define a research paper? It is a piece of academic writing that is completely based on the original research of an author on a particular topic. It also analyzes and interprets the findings of this research. There are various types of research papers, such as a course work, a diploma work or a doctoral dissertation. This article offers some effective tips to write a good research paper. Achieving supreme perfection requires having more than just the knowledge. Thus, it is recommended to have a positive attitude and believe in your own ability to achieve the highest results. That is actually a great start to write a research paper that is worth a grade A+. The topic you choose for your research paper should be both interesting and challenging. Your attitude towards the topic usually determines the amount of time and effort you are ready to put into your research. Before starting full-scale research, it is necessary to obtain an approval for your topic from the teacher. If you have any difficulties with understating the assignment or completing the project, you should re-read your task sheet carefully one more time or ask your teacher to explain exactly what is expected of you. Don’t forget to select a subject among interesting research paper topics. In this way, you will always stay motivated and inspired. In addition, it is easier to manage the subject you feel confident about. Thus, try to avoid subjects that you find too specialized, technical, or learned. The same goes about the topics with a limited range of source materials. In order to find the most reliable sources of information, you should pay attention to domain name extensions. For example, .edu (educational institution), .org (non-profit organization) or .gov (government) tend to provide you with the latest data that is more credible. However, try to double-check the information in order to avoid possible political bias when using some government sites. Even though some .com sites are really excellent, be selective of them as they usually contain only advertisements for products. There are also numerous personal home pages the quality of which varies greatly. Learn how to assess websites critically in order to search more effectively on the Net. It is definitely helpful in terms of eliminating irrelevant sites and, consequently, saving more of your precious time. Considering the variety of domain name extensions that has recently arrived, there might been some confusion in telling the difference between them, whether a .cc or .tv site is in reality a .net, a .com, or an .edu site. Thus, it is also recommended to check out print materials that you can easily find in the public and university libraries, for example, encyclopedias, dictionaries, magazines, newspapers, government publications, guides, reports, zip or postal code, etc. It is also worth checking out government agencies and businesses and contacting people in your community that might be knowledgeable in the field you are researching. Making research requires reading, evaluating, printing out, photocopying, bookmarking Internet sites, and taking notes of relevant information. Once you have gathered your resources, it is high time to write down full bibliographical information including author, title, date of publication, publisher, place of publication, page numbers, creation dates on Web pages, URLs, and the date of your access. It is highly advisable to save this document on your laptop or desktop computer and print out a copy to be sure you don’t lose it. If an article doesn’t have bibliographical information, it is useless because it cannot be cited as a source. A thesis statement is normally required in the majority of research papers. If you have any doubts, you should better ask your teacher about the requirements to your paper. The main idea of your research work is presented by a thesis statement. Thus, it is usually a key component as it conveys a central point of the whole piece of writing. It is essential that the arguments you provide are based on this central idea. The thesis statement should consist of one or two sentences. So, some critical thinking is a must. Since the main point of your research is to provide arguments that support and defend your idea, a thesis statement can be compared to a declaration of your belief. If you feel the lack of ideas for your research paper, access essay examples database to get inspired. This great research offers a wide range of original essays that are classified by topic. A thesis statement is usually provided in the introduction part of your paper. Undoubtedly, it is hard to make up a thesis statement immediately when you have just started carrying out your research. Before you create a thesis statement, it is important to collect data, analyze materials and organize ideas. Do not expect to formulate a final statement before you have fulfilled the assignment and completed the paper. Be prepared to change your thesis statement while you are developing your ideas. It is critical to avoid generic and vague statements or arguments. In order to appeal to the audience, the paper should present new and educative information to read. If you want to attract your reader’s attention with your thesis statement, you shouldn’t cite any other authors in this section. This is one of the keys of how to write a good research paper because instead of simply copying, you present your own ideas using your own words. The aim of the thesis statement is to explain your interpretation of the subject to the readers. You should mention your expectations from the paper and answer the questions provided in the assignment. Additionally, you should ensure that your thesis statement is strong. Preferably, it should be revised by your instructor to avoid any confusion. Otherwise, you may evaluate it yourself by checking whether your statement answers the assignment question, whether your position can be disputed, whether your statement is precise enough, whether it provides new information, etc. Bear in mind that changing elements of your essay while writing and reviewing is absolutely fine. So, if you notice that your paper is lacking some of the vital elements, it is required to add them. Moreover, if your arguments aren’t disputable, check them out so that you write a real argument instead of providing a summary. In order to get a well-prepared thesis statement, you should first shape your ideas in a logical and constructive way. In this way, your credibility as an author of the paper increases. Last but not the least, a well-shaped thesis makes a good impression about its creator. 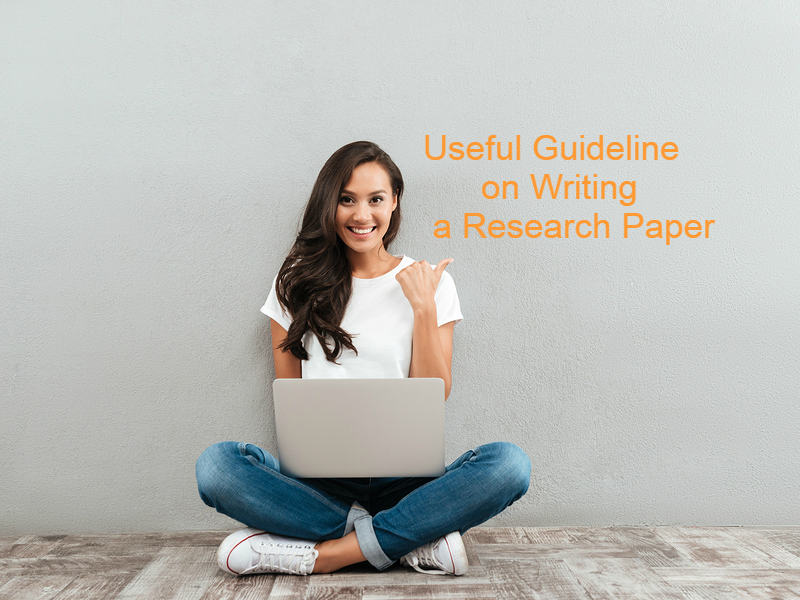 Basically, a research paper consists of a title page, abstract, introduction, manuscript body, reference, and optionally tables, figures, and appendix. It could be written either in a formal or informal way. An informal outline serves as a tool to help you organize the ideas. Since it is more like a working outline, some elements can be revised, added and canceled. With its help, an author is able to arrange the key points and make them clear for readers. At the same time, a formal outline might be asked to submit. In this type of an outline, an author should use numbers and letters in order to arrange topics and subtopics in a logical order. Once you have written an outline to your paper, organize all the research data by critically analyzing it. With the help of available sources, verify whether the information is up-to-date, factual, and correct. You should also note the opposing views to support your thesis. This is probably the most important step in the process of writing a research paper, which involves analyzing, sorting, synthesizing, and digesting the data you have gathered. You must learn how to effectively communicate your ideas and research findings to readers through written words. Start with working on each idea you plan to develop in your research paper by using a technique that suits you the best. It is advisable to organize it according to your outline to save time later when revising and improving your essay. In this way, writing a final paper is a piece of cake. Having followed the steps mentioned above, you know exactly how to write a good research paper. So, it is time to type the final paper, proofread it carefully for spelling, missing words, punctuation, and have it ready at least a day before the deadline. Believe it or not, A+ is just around the corner. Every time you get to the middle of a school year, you come up with more intricate ways of procrastination. So do I. Studying processes can flow tolerable unless you appear to forget tomorrow’s research paper deadline. Then, panic blows your mind and you run from one corner of the room to the other cursing Netflix and all your favorite TV-series. Stop. Take a deep breath and listen how to compose the last minute research paper tonight. Students have already found a solution in case of such disasters. Yet, remember, it’s not what your teacher has taught you to do. Custom research paper writing overnight requires certain guidance and motivation. If you are going to make it, get the working mood and don’t stop. If you are lucky to choose a topic for your last minute research paper, pick something simple, easy to discuss, with a pile of accessible material to cite. Define your topic and write a first vague draft of your thesis statement. This time you are writing a research paper basing on other people researches, because you don’t have time. Don’t try to jump over your head. Start with the research. Break clichés and search on Wikipedia. Despite all controversial judgments, it’s perfect to get a general impression of the theme and borrow an outline. Just don’t copy/paste it to fail your paper from the first look. Now, you are ready to move to Google. Choose the best parts of the Wikipedia material and find them in other reliable sources. In such a way, you contribute to the reference list along with gathering information. Don’t forget to write down every source. Among a plenty of online pages, try to use books or print articles to convince your professor you did a real research. Writing a research paper in one night, you may buy cheap Kindle books if you are sure they contain useful information. Life hack: If you can’t find anything except a sample book, try to guess the page number and include the source to your works cited page. Copy/paste all attractive and meaningful sentences from different sources to your draft and paraphrase them in your own words. NEVER ever plagiarize anything. Not just because it’s bad, you can get caught. Don’t forget to form references while rewriting. Delete original text right after paraphrasing. When you have done the research, and you have almost composed the body, determine your thesis statement in its final version. Make it clear and simple, based on the processed material. It will be the last sentence of your introduction part. Now, you can organize all your passages in the logical order, put subtitles, write connectional sentences between passages and so on. It’s better to write each part as a small independent essay with its introduction, body, and conclusion. In the end, write the main introduction and conclusion parts. The first one should contain a short review of the topic, and the last one should highlight the influence of the discussed issue. Don’t forget to arrange your references properly. Use net to add to your sources. Finally, look through your paper to correct any mistakes or logical gaps. Tip: Print your paper in advance; you never know what happens with your printer a few minutes before class. Whenever you receive a 10-page long research paper to complete, it seems to be a nightmare. However, there is a way of how to write a 10-page paper without much struggle. Don’t shy away from the idea to write a little longer essay. Even if you are not completely sure how to write a 10-page paper with its complex structure and sometimes overwhelming requirements, you can do it. Today, we will help you to master how to write a 10-page paper in one night with ease and brilliance. To complete such a challenging assignment, you’ll need to calm down and organize your studying process carefully. If you follow these simple steps, which we’ve compiled for you, you’ll be able to compose your masterpiece in one night and get high grades the next day. So, let’s start! Look through the material you have found and mark the most interesting parts. Basing on your little research, write down 4-5 sub-topics you are going to discuss in your essay. In such a way, you’ll end up composing a couple of small essays instead of a long boring paper. Write a short plan to help you keep thoughts in one flow while you are working. To claim a strong beginning, put a thesis-statement in the first place. Write a proper introduction part that includes a short description of each sub-topic mentioned in your outline. Complete each part as an independent essay. Maintain the introduction-body-conclusion order in each piece. Don’t postpone bibliography at the end. Write down the name in your reference list just after you quote someone. Edit only after completing the whole essay. In case, you are short of time, it’s better to have an essay with mistakes than to bring only the introduction part. Follow the formatting requirements from the very beginning. If you need to write with bigger spaces and letters than you usually do, you’ll avoid cutting off extra parts in the end. You will also save time on writing your treasured 10-page paper in one night. Don’t forget to press “save” button now and then. Look through your text to find any typos and to check the semantic load. Try to make your essay easy to read and understand. Make sure each part has a logical connection with the previous piece. Once you’ve finished writing, save your essay and e-mail it to yourself. A copy in the web will allow you to access your paper from any device and in case of a computer crash. Proofread your paper. Check whether the whole piece corresponds to the thesis statement at the beginning. Look through the conclusions and bibliography. Give your paper to someone in order to double-check any mistakes or nonconformity. That’s it! Don’t get desperate; you can do it in time!